You were designed to worship God. God created us in His image, and intends for us to live in relationship with Him. As King Solomon wrote in Ecclesiastes 3:11, God has truly set eternity in our hearts. These two dynamics (our worshipful design and our sinful disposition) form a fitting parenthesis within which all of human history can be explained. Thankfully, God understood this reality and made a provision for sinful people to be made right with their Creator. This was a plan God had from the foundation of the world, but was revealed progressively over time. Old Testament scholar Ron Allen once explained this progressive revelation as a blooming rose — all the petals were there from the beginning, but as the flower opens over time, we can see more of its beauty. In the same way, God’s redemption plan for humanity blooms throughout the Old Testament until gaining full exposure in the person and work of Jesus Christ. Knowing this helps us make sense of certain practices we see in Scripture . . . and certain archaeological ruins I visited on our tour of Israel. 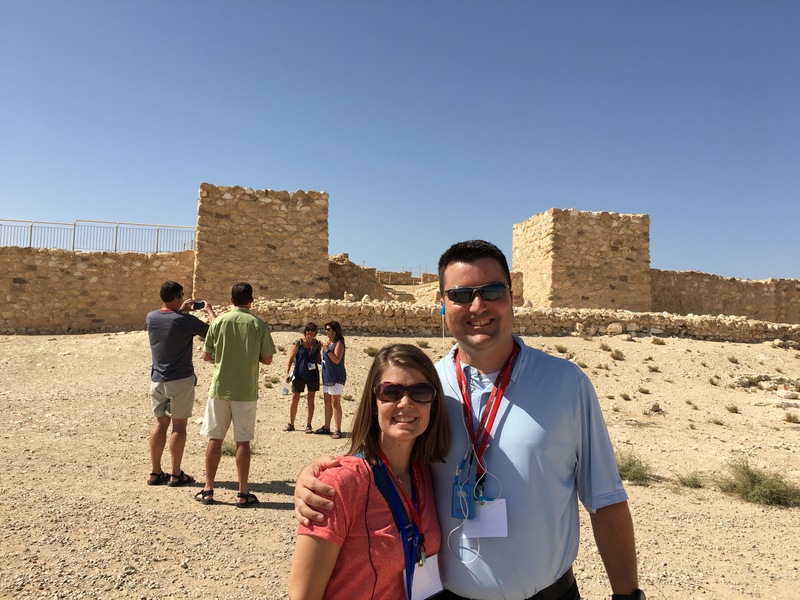 In the desert ruins of ancient Arad on the edge of the Negev, we saw the excavated remains of a replica of the Solomonic Temple. 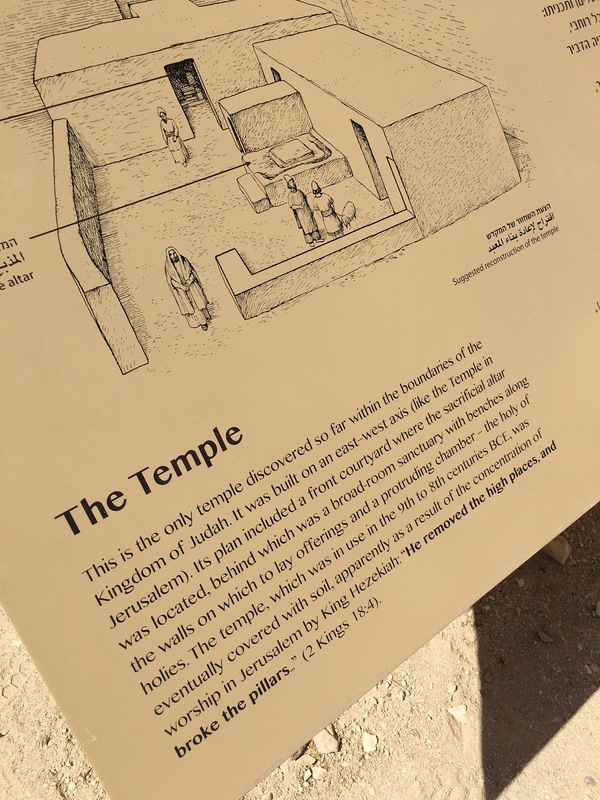 What in the world was a replica of the Temple (a building only intended for Jerusalem) doing in the wilderness? And why was it destroyed? The origin of Arad’s Temple (complete with a “holy of holies,” a sacrificial altar, and an outer court) is somewhat of a mystery. Most likely Solomon himself (or someone after him) decided to build this replica to make worship of God more accessible to the people of the Negev. At one level, this seems like a noble effort. After all, the Temple was the place where atoning sacrifices could be made for people’s sin, allowing them to be reconciled to God. It is not hard to imagine an ambitious King or leader thinking “If one Temple is good . . . two will be great!” However, as God continued to bloom the rose of His redemption, He showed His people that there was only one sacrifice that He would accept for His people’s sin, and that sacrifice would be offered in Jerusalem. King Hezekiah, in 2 Kings 18:1-4, was inspired by God to destroy all vestiges of pagan worship AND the destruction of all other altars throughout Israel to consolidate sacrificial worship to Jerusalem. Therefore, Arad’s Temple copy was destroyed around 700 BC. Interestingly, 2 Kings 18:4 also lets us know that the bronze serpent that Moses held up in the wilderness (see Numbers 21 for details) was also destroyed by Hezekiah at this time. Apparently, the staff had become a relic for veneration by the people, shifting their focus to “lucky charms” instead of to God Himself. It is possible that this staff was kept in Arad’s Temple, since the physical location of Arad was relatively close to the location where the staff was first raised (see references to Arad in the Numbers 21 reference above).